All the kids always ask for Jon, “Where’s Jon? Is he here... He’s on my team! !” A humble guy by nature, Jon is modest when we acknowledge him for his contributions to JHRP. 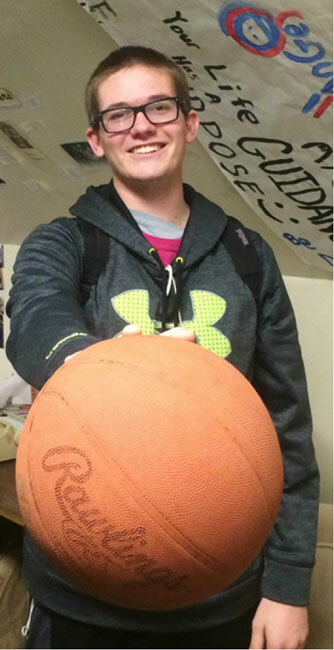 A basketball enthusiast, Jon’s favorite activity is to play and practice honing skills alongside the eager teens. He says that all he does is, “Just play basketball,” when in reality he does more than dribble the ball and shoot hoops. He mentors and encourages the youth to participate, and (seemingly unknowingly) appoints himself as a positive role model to those who may have not formally had a reliable guide. On one particularly memorable mid-semester service day, Jon managed to encourage the girls to join in on a game of basketball; a phenomenon even the guards were surprised to see take place. As a volunteer of three semesters, I had never seen a female youth play basketball or even approach the basketball court/hoop. Among our group of many special volunteers, Jon’s story is just one example of how the collection of unique backgrounds encourages a deeper level of connection with the misunderstood youth at the hall. After volunteering for just one semester, Jon was able to make an established impact at the Eureka Juvenile Hall. Whether the youth remembered him simply as the tallest volunteer among us HSU students, or the "guy that plays basketball all the time," Jon has impacted their lives in a positive way. Some teens even remembered him outside of the juvenile hall; during one of our weekly meetings, Jon spoke to all of us returners and new volunteers about how much it means to the kids to be a great volunteer.One day at work, one of the former kids in the hall remembered and approached Jon to communicate his feelings of gratitude. The youth expressed how much it meant to him and his fellow peers that HSU students took a few hours out of their day to spend quality time with the youth at the hall. The Juvenile Hall Recreation Program is an organization at the Y.E.S. House that serves incarcerated youth in Eureka. While there are many restrictions on which activities volunteers of JHRP can participate in, the volunteer’s time and positive attitude is always appreciated by everyone. Jon is a revered volunteer in the YES Juvenile Recreation Program.